Virender Sehwag struck a fluent half-century in the first outing of his comeback bid into the national side but that was not good enough to prevent a formidable Delhi side from losing by 18 runs to India Blue in the opening game of NKP Salve Challenger Series. Promising all-rounder Parveez Rasool impressed with a five-wicket haul but West Indies A held the edge as they made inroads into the India A batting line-up after being all out for 429 in the first unofficial Test. Suresh Raina smashed a quickfire half-century while skipper Mahendra Singh Dhoni produced a belligerent unbeaten knock of 63 as Chennai Super Kings toyed with a listless Sunrisers Hyderabad bowling attack to post a massive 202 for four in their Champions League T20 match. Modi out, but was he BCCI’s only villain? It may have got tricky for Mumbai Indians after one defeat and a washout, but skipper Rohit Sharma is still very optimistic about his side’s prospects in the Champions League Twenty20. Indian eves hopes of earning a berth in next year’s World Cup came down crashing after they lost 1-2 to defending champions Korea in the semifinal of the eighth women’s Asia Cup hockey tournament. India on Thursday sealed a place in the final of the third Under-21 Sultan of Johor Cup handing out a 6-1 thrashing to South Korea at the Taman Daya Hockey stadium in Johor Bahru in Malaysia. It was India’s fourth consecutive win, after beating England (2-1), Argentina (3-2) and Pakistan (4-0). India have collected 12 points and will play their last league match on Saturday against Malaysia. Salary remains the only stumbling block in Terry Walsh’s likely appointment as new foreign coach of Indian men’s hockey team as the Australian is demanding a hefty pay cheque, according to sources in the Sports Authority India. Seasoned professional Shankar Das and an in-form S Chikkarangappa climbed to the top of the leaderboard at 13-under after the third round of the PGTI Players Championship at Panchkula Golf Course, leading the field by three strokes. Indian golfers had a rough start to their campaign at the Asia-Pacific Panasonic Open today, as none of the six were able to shoot under-par rounds in the first round at the challenging par-72 Ibaraki Country Club. Leander Paes and his Italian partner Daniele Bracciali today stormed into the semifinals of the Thailand Open in Bangkok after defeating Colombian pair of Juan Sebastian Cabal and Robert Farah in a three-set thriller. Idolised for his immense skill on the field, four-time World Footballer of the Year Lionel Messi’s squeaky-clean image off the pitch will come under scrutiny on Friday when he faces a judge accused of tax evasion. Playing without skipper Yuvraj Singh, who skipped the tie due to a stiff back, India Blue scored 270 for six in 50 overs courtesy a 73-ball-91 by Mumbai all-rounder Abhishek Nayar. In reply, Sehwag, who came in at number four, batted in his customary style, smashing his way to 59 off only 39 balls with the help of nine boundaries and a six but Delhi could manage only 252. Veteran Rajat Bhatia’s all-round effort (3/46 in 10 overs and 65 runs) and Ashish Nehra’s career best List A score of 37 not out went in vain. With Yuvraj skipping the game, the interest for the 10,000 odd spectators was some fireworks from Sehwag and Kohli. But, Kohli (5) disappointed as he played away from his body to a Bhuvneshwar Kumar (3/58) delivery which was snapped by Naman Ojha. 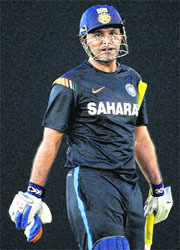 Coming at two down, Sehwag started with a cover drive off Kumar’s bowling. In the next over bowled by R Vinay Kumar, Sehwag hit a spanking square-cut and then lofted the seamer over extra cover for a six. The moment he was given width, the ball raced through the cover region; anything on the pads was treated with equal disdain. Having played his last competitive match (during IPL in early May), a leaner Sehwag did not look rusty during his short stay at the wicket. It was Bengal left-arm spinner Iresh Saxena who got lucky when he managed to latch on to a powerful return catch offered by ‘Nawab of Najafgarh’ which had Delhi in trouble at 85 for four. At stumps on the second day of the match, India A were in a spot of bother at 124 for three, with skipper Chesteshwar Pujara back in the pavilion. The hosts were trailing the Kirk Edwards-led side by 305 runs with seven wickets in hand. Manpreet Juneja was unbeaten on 47 off 77 balls while Harshad Khadiwale was batting on five. Opener Lokesh Rahul made 46 off 100 balls at the Gangothri Glades Cricket Ground. Earlier, Jammu and Kahsmir cricketer Rasool emerged as star of the day by taking five wickets for 116 runs in 45 overs. While the rest of the bowlers struggled to get rid of the West Indies tail-enders, the 24-year-old off-spinner always seemed to be on the lookout for wickets. Resuming at 264 for five, the last five West Indian batsmen frustrated the Indian bowlers by contributing a commendable 192 runs. West Indies A lost their overnight batsman Chadwick Walton in the fourth over of the day. Walton could only add eight runs to his overnight unbeaten 27 before being trapped leg before by pacer Ishwar Pandey. Assad Fadudin (not out 86) and Nikita Miller (49) then thwarted the Indian bowlers, putting on a crucial 88-run partnership for the seventh wicket. Miller was unfortunately run out by the Pujara-Rohit Motwani combo. His innings came off 86 balls and was studded with five boundaries. West Indies lost another wicket in the form of Veerasammy Permaul (11), but not before crafting a 42-run stand for the eighth wicket with Fadudin. Rasool then quickly packed off Delorn Johnson (0) and Miguel Cummins (6), leaving Fudadin 14 short of what would have been a well-deserved century. He faced 201 balls, hit 10 fours and a six. In reply, Indian openers — Rahul and Jiwanjot Singh Chouhan — began on a cautious note. The pair put on 45 runs for the first wicket, before Chouhan was gleefully caught by wicketkeeper Chadwick Walton off left-arm spinner Permaul for 16. Miguel Cummins grabbed the prize wicket of Pujara for three. Suddenly, India A were struggling at 49 for two, but a 60-run stand for the third wicket between Rahul and Juneja put the hosts back on road to recovery. Juneja, who scored 193 in the second unofficial Test against New Zeland A at Visakhapatnam earlier this month, displayed his class once again. Coming into bat at 49 for two, Juneja got his act right with an aggressive approach, hitting seven boundaries. Rahul found the fence seven times before he was caught by Leon Johnson off Miller. In reply, Sunrisers put up a tough fight through Shikhar Dhawan (48) and Darren Sammy (50). Their heroic effort notwithstanding, Sunrisers fell short by eleven runs. Dhoni broke the spirits of the Sunrisers bowlers with his ruthless batting display. Such was the brutality that neither speed nor spin provided any challenge to Dhoni as he decorated his 19-ball knock with an astonishing eight sixes, out of which five came off in the 18th over, bowled by Lankan all-rounder Thisara Perera. Dhoni, in the process, also struck the fastest fifty in the history of the Champions League, reaching the landmark in just 16 balls and surpassing West Indian Kieron Pollard's record (50 off 18 balls). Before Dhoni's arrival, the show belonged entirely to Raina and his powerful stroke-play. Walking in to bat after the dismissal of opener Murali Vijay, Raina took time to get his eyes in and then made the most of the Sunrisers' tactics of utilising pace against him. Needing a win to keep their hopes alive after collecting just two points, Mumbai will take on Highveld Lions in their third group A league match at Sawai Man Singh Stadium. “In this format you get only four games and with one lost and other washed out we know the position we are in. We understand what needs to be done. We are raring to go and have to win both of our remaining matches. But we don’t want to take pressure and want to do what needs to be done,” Rohit said today. Rohit felt their performance against Rajasthan Royals, to whom they lost, was “not bad”. The Koreans scored two early goals through Cheon Seul Ki (2nd minute) and Cheon Eun Bi Min (9th) to stun the Indians. India tried hard to make a comeback in the second half and pulled one back through Ritu Rani in the 41st minute, but the Koreans did just enough to hold on to their slender lead. India confirmed their berth as Malaysia beat Pakistan in Thursday’s last match. It was a commanding performance from the Indians as they dominated the first half, racing to a comfortable 3-0 lead. India opened the scoring through Amit Rohidass in the seventh minute whose penalty corner drag flick sailed high into the right hand corner of the South Korean goal with keeper Lee Se Young watching helplessly. Two minutes later India doubled their advantage as Satbir Singh put the finishing touches to a move from the right by Harjeet Singh. India widened their advantage as Talwinder Singh scored in the 31st minute to make it 3-0. However, the Koreans pulled one back in the 34th minute when You Seung Ju scored. India slowed down the pace in the second half, conceded a couple of penalty corners but did well to keep opposition from scoring. Former Australia coach, Walsh’s name has emerged as the front-runner for Michael Nobbs’ successor from the six applications received by the Hockey India. According to sources, presently negotiations are on between Walsh and SAI on the double Olympian’s salary and an official announcement on this front is expected in a week’s time. It has been learnt that Walsh is demanding a heftier pay cheque, somewhere in the range of Australian dollar 14,000-15,000 per month, for accepting the high-profile job. Nobbs was receiving a monthly salary of Australian dollar 11,000 (approximately Rs 75 lakh) at the time of his resignation. SAI pays the salaries of all foreign coaches and it is bargaining hard with the 60-year-old, who also coached the Netherlands men’s team. SAI will forward the name of the selected candidate to the Sports Ministry for its final approval. Nobbs resigned from his position on health grounds (acute hypertension) in July this year and the post has been lying vacant since then. Das started his round with pars followed by a bogey on the seventh hole. However, five consecutive birdies on the ninth, tenth, 11th, 12th and 13th (narrowly missing a hole-in-one on the par-three) and a birdie on the 16th resulted in a 67 today. "My aim was to try and play steady and conservative golf after the bogey on seventh but then the putts started dropping in. I was hitting the ball close and my tee-shot on the 13th missed the hole by a whisker," said Das, a three-time winner on the tour. Meanwhile Chikkarangappa, who was tied for second overnight, bettered his position with a 68 today. He birdied the first, made a three-putt for bogey on the fourth, and then picked up seven birdies on fifth, ninth, 10th, 11th, 13th, 16th and 17th. But an out-of-bounds drive on the last, which resulted in a triple bogey, ruined an exceptional round. "I played well but one bad shot resulted in three dropped shots. I feel confident; the layout of this course is similar to that of my home course in Bangalore. I have won a junior title here so I think my chances are good," said Chikkarangappa. Another seasoned professional Shamim Khan (-10) carded a 70 today that left him tied for third with Amardip Singh Malik, who shot a 69 in the third round. Angad Cheema, Kunal Bhasin and Abhinav Lohan are tied for fifth, at nine-under, while Sujjan Singh is sole eighth at eight-under. "I am happy with my form and hoping for a good finish tomorrow," said Sujjan. Shiv Kapur (76) fared the best amongst the Indians, tied for 73rd. Himmat Rai, Digvijay Singh and Jyoti Randhawa carded five-over 77 each to be tied 85th, while Bangalore duo Anirban Lahiri and C Muniyapa were even further down in 111th place, with rounds of seven-over 79 each. As of now the cut looks likely at four or five-over. Japanese star Shingo Katayama fired a flawless eight-under 63 to take a two-shot lead over Thailand's Pariya Junhasavasdikul in the opening round. The second seeded Indo-Italian duo won 6-7(4) 7-6(8) 10-8 in the quarterfinal match that lasted two hour and two minutes. They play third seeded pair of Jamie Murray of Scotland and John Peers of Australia in the semifinals. Meanwhile, in the Malaysia Open in Kuala Lumpur, Somdev Devvarman and his South African partner Rik De Voest scored an upset win over second seeds Nenan Zimonjic of Serbia and Julien Benneteau of Switzerland in the quarterfinals. The duo of Somdev and de Voest came from behind to win 3-6 6-4 10-7 in the quarterfinal match that lasted one hour and 12 minutes. The Argentine and his father Jorge Messi are due to appear in court on Friday morning in the coastal town of Gava near Barcelona, where the player resides, accused of evading tax on Messi’s image rights to the tune of 4.16 million euros ($5 million, £3.5 million) between 2006 and 2009. Kanpur: The Annual General Meeting (AGM) of the Uttar Pradesh Cricket Association scheduled tomorrow is expected to be a stormy affair with some members likely to oppose the changes proposed to be made in the selection panels and functioning of the body. According to sources, Mayank Bajpai, who was appointed as a General Manager last year, would be given greater say in the functioning of the UPCA besides a hike in salary and perks while another GM and former Ranji player Rohit Talwar could be moved from his post and given charge of UPCA Cricket Academy. Paris: World number one Novak Djokovic took to Twitter to announce his engagement to swimwear model girlfriend Jelena Ristic. Alongside a photo of the happy couple Djokovic, 26, tweeted late Wednesday: “Meet my fiance and future wife :) So happy! Thank you for wonderful wishes #NoleFam and friends” Ristic, 27, who as well as modelling also runs her future husband’s charitable Novak Djokovic Foundation, is a frequent courtside spectator. She and Andy Murray’s girlfriend Kim Sears emerged as the queens of Centre court at Wimbledon this year, the glamour duo living every point as their respective partners slugged it out for the All England Club title. Manchester: Manchester United ruined Luis Suarez’s long-awaited return from a 10-match ban for biting by beating Liverpool 1-0 in the third round of the League Cup on Wednesday, relieving some early-season pressure on manager David Moyes. Javier Hernandez showed a poacher’s instinct to volley home deftly 39 seconds into the second half, as United advanced despite fielding a largely second-string team against its fierce rival at Old Trafford. New Delhi: Two Indian boxers were assured of medals in the youth event of the ongoing AIBA Women's Youth and Junior World Championships, in Albena, Bulgaria, after entering the semifinals. Nikhat Zareen (54kg) and Simranjit Kaur (60kg) made the last-four stage after winning their respective bouts comfortably. Nikhat, the reigning junior world champion, defeated Italian Desire Galli, while Simranjit got the better off Justine Moerl from Germany. Both the boxers clinched the bout courtesy unanimous decision of the judges. Kocaeli (Turkey): Indian Grandmasters Vidit Gujrathi and SP Sethuraman are in medal contention after defeating Jorge Cori of Peru and Vladislav Kovalev of Belarus respectively in the 12th and penultimate round of the world junior chess championship. The victories took Gujrathi and Sethuraman to nine points out of a possible 12 and at least one of them looks poised to win a medal.